Horacio Domingues: Here's that announcement that I've been teasing: Next year, American Mythology Productions will be releasing the most incredible, mind-boggling, bizarro comic laugh fest that you've ever seen (hopefully): THE FILBERT FACTOR! This new series is created and written by me, with character designs by Adrian Ropp, and interior art by Adrian and Horacio Domingues, colors by Jeremy Kahn, and lettering by Natalie Jane. 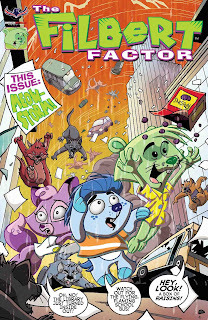 THE FILBERT FACTOR chronicles the day-to-day adventures of Filbert the ferret, Cashew the hedgehog, and Hazel the fox, in the city of Turtleview, where anything goes and all logic is thrown out the window. What I hope to capture in this series is the freewheeling, no-holds-barred insanity of kids' cartoons, where the laws of nature and science are defied, and there's a subtle hint of the macabre, because who doesn't like creepy stuff? Watch for more details, special announcements, and the release date, coming soon! Here's that announcement that I've been teasing: Next year, American Mythology Productions will be releasing the most incredible, mind-boggling, bizarro comic laugh fest that you've ever seen (hopefully): THE FILBERT FACTOR! This new series is created and written by me, with character designs by Adrian Ropp, and interior art by Adrian and Horacio Domingues, colors by Jeremy Kahn, and lettering by Natalie Jane. THE FILBERT FACTOR chronicles the day-to-day adventures of Filbert the ferret, Cashew the hedgehog, and Hazel the fox, in the city of Turtleview, where anything goes and all logic is thrown out the window. What I hope to capture in this series is the freewheeling, no-holds-barred insanity of kids' cartoons, where the laws of nature and science are defied, and there's a subtle hint of the macabre, because who doesn't like creepy stuff? Watch for more details, special announcements, and the release date, coming soon! Looking for work (from home) Thanks!